There are literally thousands of published material out there on composites. The plan here is just to give you a basic idea of the composite-building methods involved with building a Long-EZ. For detailed information, refer to Chapter 3 in the Long-EZ plans. The Long-EZ incorporates a hand-layup composite building method. You cut foam to the desired shape (by means of hot-wiring or knife trimming), and apply layers of fiberglass over the foam. Epoxy is then poured over the fiberglass cloth and squeegeed until the entire cloth is 'wetted out'. When the fiberglass cures, you trim the edges and are left with a very strong stiff structure. The combination of type of foam, epoxy and fiberglass cloth used is very important. The builder must always follow the directions indicated in the plans. Altering any one of these may result in a weaker part than originally engineered, leading to potential failure. There are many types of fiberglass clothes to choose from in the market today. The Long-EZ plans calls out two basic types: unidirectional (UND) and bidirectional (BID). Bidirectional means the major cloth fibers run in both horizontal and vertical directions. BID is used on parts where the load will be distributed throughout (e.g., wing surface, bulkheads, etc.) 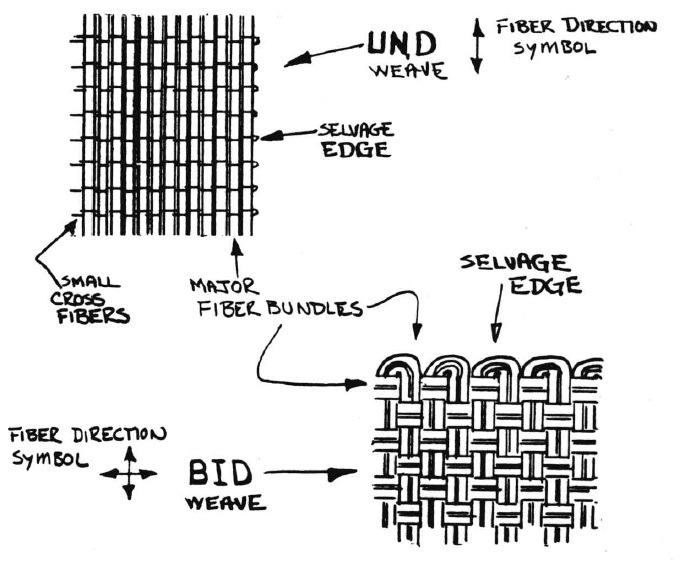 Unidirectional means the major cloth fibers run in a single direction. UND is used on parts where the load is expected to run in a given linear direction (e.g., wing spar, canard spar, etc.) Fiberglass cloth is typical sold by the yard and comes in 38" wide rolls. Aircraft Spruce sells these under 'Rutan Fiberglass cloths' - UNI = RA7715 and BID = RA7725. An epoxy system is a two part component: the resin and the hardener. The resin will not cure until it is mixed with a precise ratio of hardener. Users have the choice of mixing by method of weight or by volume. My personal preference is to mix by weight, since you do not know how much hardener is being left behind when pouring it into the resin cup if mixing by volume. Furthermore, you would be using many more paper cups. I find the digital scale method to be very accurate and easy to use. You will find many builders tend to be very opinionated about which epoxy is 'the best' one. The fact is, there is no 'best'; like with any other engineering problem, the solution is best answered with: 'it depends'. Each epoxy system has its own physical properties. Some might work better for one application, while another will work better on another. When selecting an epoxy system, make sure to look through the manufacturer's published MSDS (material safety data sheet). This sheet provides you with all the physical properties of the epoxy and can help you determine whether or not their product fits your application. Some physical properties you should look at are: cured tensile strength, density, pot life, and viscosity. Another important physical property you should be interested in is the glass transition temperature (Tg). The Tg is the temperature from which the cured resin will begin to transition back into a liquid state. You'll be surprised to know that most epoxy systems that cure at room temperature (i.e., systems that do not use autoclaves to cure at high temperature and/or pressure) have a Tg of about 200F. This is the reason 99% of homebuild composite airplanes are painted white. Any other color might cause the composite surface to reach a temperature higher than 200F in the hot sun and cause the surface to weaken. You can purchase small samples of a few systems and try them out. Some builders are particular about the strong odor, cured color, etc. I would ignore these and focus on the important traits: tensile strength, Tg, and ease of wetting out cloth. Typically, the lower viscosity the product is, the easier it will be to wet out the fiberglass cloth. Temperature plays a big roll in determining the systems viscosity. The colder it is, the harder it will be for the epoxy to get in between all the fibers. Because of this, it is highly recommended that you have a 'hot-box'. A hot-box is a cabinet (or a cardboard box) that is temperature controlled to keep your resin warm right before you mix it. Most systems are happy being kept at 90F. This will assure your epoxy is warm, and hence will flow like water into your cloth. 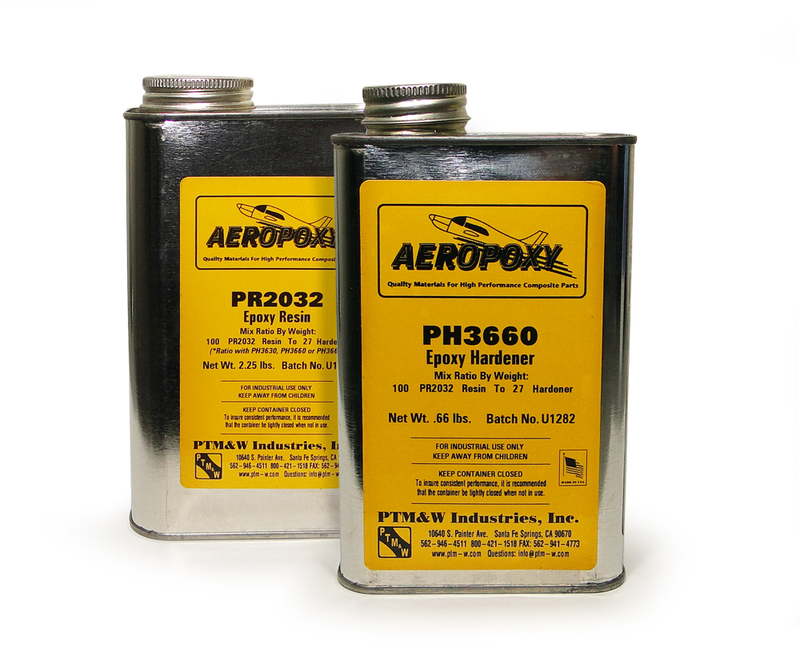 One last note about epoxy brands - not all epoxies are fuel resistant. When it comes time to build your fuel tanks, you'll either have to use a special type of epoxy or use a special seal (e.g., Pro-seal) to protect the inside liner of your fuel tanks. Otherwise, the fuel will eat into your composite and end up with gunky stuff in your fuel lines - a big no-no! See my Chapter 2 - List of materials section for more details on this topic. 'Micro' is a mixture of mixed epoxy (resin and hardener) with microspheres. Microspheres are tiny spheres of glass used to thicken the resin for various purposes. Throughout the plans, you will see the following terms being used: slurry, wet micro, and dry micro. The only difference between the three are the ratio of epoxy to microspheres. Microspheres do not need to be accurately measured (like you do when mixing epoxy). Slurry - one part microspheres to one part epoxy (by volume): used for painting the foam surface before the first glass cloth is applied over it. Do NOT use slurry or any other micro in between layers of fiberglass. Wet micro - two to four parts microspheres to one part epoxy (by volume): used to join foam blocks. It is thicker than slurry, but will still sag and run (like thick honey). Dry micro - five parts microspheres to one part epoxy (by volume): used to fill low spots and voids. Won't sag or run (like a dry paste). Flox is a mixture of cotton fiber (flocked cotton) and epoxy (resin and hardener; no micro). The mixture is used in structural joints and in areas where a very hard durable buildup is required such as a 90 degree corner or edge. Flox is also used to bond fiberglass to wood or metal. When using it to bond with metal, be sure to sand the metal dull with 220-grit sandpaper and paint pure mixed epoxy (no flox) on the metal first. Flox - two parts flock to one part epoxy (by volume): mix in just enough to make the mixture stand up (like applesauce). Wet flox - one part flock to one part epoxy (by volume): mix it so it will sag or run. The "baker's flox trick" - simply put a ziplock bag into a cup, pour the flox into the ziplock. Cut the tip and use it as a baker does when applying icing on a cake. This makes applying flox a lot easier! 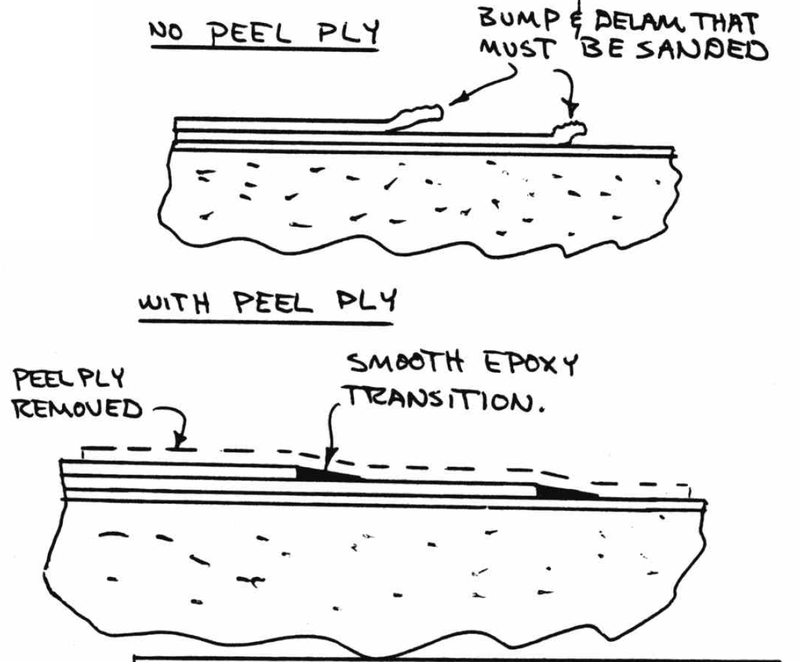 Peel ply is a type of fabric (Dacron) that has the magical power of not bonding to epoxy. It has two major uses: 1) to create a smooth transition between staggered plies, or 2) to create a smooth surface such that when cured, the surface does not require to be sanded dull if planning to bond another part to it. While the layup is still wet, peel ply is applied to the very top layer only. Once cured, the peel ply is removed (like peeling off a band-aid). This leaves behind a very smooth surface. Peel ply comes in large 62" wide rolls or small 'tape-like' rolls 1" or 2" wide. The plans do a good job at telling you when and where to use peel-ply. When you order peel ply, make sure to get the 'smooth' type, not the 'pinked' type (pinked refers to the edge of the tape, which is a teeth-like pattern mainly used for fabric covered aircraft).